Two funny ladies get serious about how women can help each other succeed in the workplace. As we celebrate Women's History Month, many of us look to honor the achievements of historical trailblazers who have gone before us — or even the various women in our life — but we likely also acknowledge celebrities who have made a difference as well. Ahead of International Women's Day, I made a mental list of acclaimed women I’ve never met who inspire me, ranging from Gilda Radner to Frida Kahlo to Parkland survivor and activist Emma González. Chelsea Handler, the talk show host, actor, comedian and writer wasn’t on the list; nor was the actor, writer, director, producer and "Insecure" creator Issa Rae. Until I heard both women speak in person. 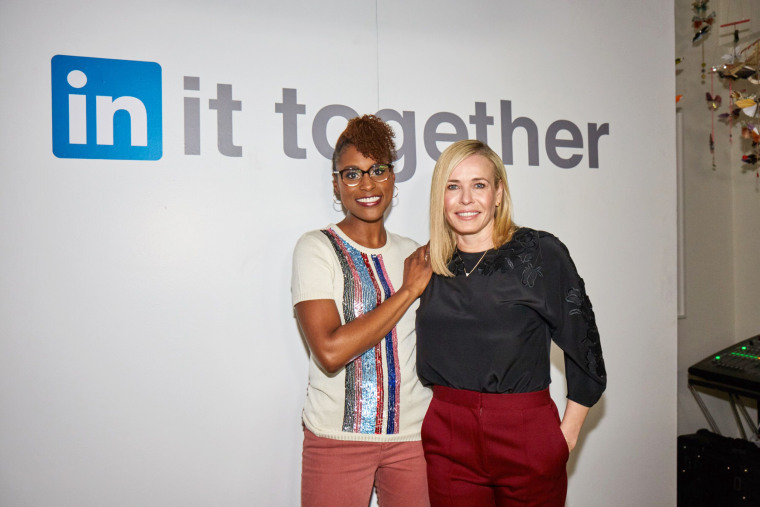 LinkedIn hosted a panel featuring both stars in Los Angeles earlier this month. The setting was casual, intimate and focused on one topic: success. Handler and Rae’s generous, candid and often hilarious advice delivered to a room packed with eager listeners not only landed them on my list of incredible women to learn from, it gave me ideas I could start acting on right away. Here’s a look at some of their most powerful insights that, though aimed at women, can be implemented by anyone at any stage in their career. Now that the door is open for me, [I’m focused on] making sure that door stays open so that other people can walk through it and tell their stories. When setting goals it can be tempting to get very specific about timing, but neither Rae nor Handler find setting end-dates all that useful. Even pioneering women as widely admired as Handler and Rae deal with impostor syndrome. But they’re pretty good at fighting it. Taking ownership of our achievements rather than attributing our successes to luck is also a powerful tool. We often look at fear and doubt as obstacles to be overcome. But what if we look at them as platforms to push off of? It works for Rae. Handler noted that when she first moved to Los Angeles as a teenager, her primary goals were to be famous and to have money. “I wanted a cleaning lady!” she cried. Certainly she’s achieved both fame and money (and probably has a housekeeper or three), but her goals have evolved as she’s matured. Handler noted that early in her career, some women in positions of power were less than welcoming. “That was disenchanting. It was a great lesson though because from that day on I knew ‘I’ll never, ever treat a woman like that,” said Handler. “I don’t ever want a woman to feel like I’m not on [her] side.” Rae agreed, noting that being discouraged by women has made her more resolute to do better. Rae added that it is especially important to her to “hold the door open” for others like her, particularly artists of color.